In this article form The Guardian newspaper major retailer Tesco discuss reducing food waste. Greenville Energy aim to become active partners with the supermarket industry in the disposal of tonnes of food waste per annum. This makes sense from a commercial perspective by reducing the amount of organic waste going into landfill that can used to fuel an AD plant not unlike our own. Also, from the environmental perspective reducing our reliance on landfill for organic waste means we are doing our bit to help the planet and the carbon footprint offset is reduced radically taking into account distances needed to travel to dispose of this waste. The PR aspect of such a partnership should not be undervalued to. British supermarkets are coming under increasing pressure to go further than rival Tesco to show shoppers what progress they are making in reducing food waste, as the government insists that such action should remain voluntary. Green campaigners have called on all major supermarkets to put an end to multi-buy deals and other marketing tools which result in customers wasting millions of tonnes of fresh food – much of it still edible – every year. The announcement on Monday by the UK's largest supermarket that it was dropping some food promotions after finding that two-thirds of produce grown for bagged salad is wasted – and revealing food waste data for its operations for the first time – was broadly welcomed. Environmental campaigners and charities, however, said they amounted to only "baby" and "tentative" steps and urged all retailers to go further. Tesco revealed that 68% of bagged salad was thrown out – 35% of it in the home. It also found that 40% of apples were wasted, and just under half of bakery items. The supermarket tracked 25 bestselling products and combined information with data from the government's waste reduction advisory body, Waste and Resources Action Programme (Wrap), to give an overall food waste "footprint" for each item. In the first six months of this year, 28,500 tonnes of food waste were generated in Tesco's stores and distribution centres. Annual figures from Wrap show that, in total, 15m tonnes of food are discarded each year in the UK, with households responsible for nearly half the waste. Of this, almost 4m tonnes are thrown away despite being edible. The announcement follows Tesco's pledge earlier this year to use its size and clout to reduce the amount of food wasted by its customers and elsewhere in its international supply chain. Friends of the Earth food campaigner Vicki Hird said: "Tesco is the largest food retailer in the UK. It is responsible for far too much of the UK waste food mountain which means wasted water, energy and land. "The supermarket needs to go much further than these baby steps to tackle the huge waste it causes in its operations, such as over-ordering and demanding cosmetic perfection, and via marketing. All retailers should stop multi-buy deals and other marketing tools which lead to customers wasting fresh food." Hird highlighted the enormous "hidden" energy, water and land costs of producing food – particularly meat and dairy products – and said there should be a national drive to slash food waste to zero. She urged retailers "to clearly change their buying practices, marketing strategies and demand for cosmetically perfect produce and also help farmers and customers towards that goal". 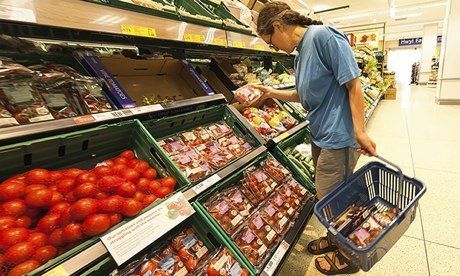 The Department for Environment, Food and Rural Affairs (Defra) oversees food and waste reduction through the third phase of the Courtauld Commitment – a voluntary agreement with the grocery and retail sector to cut both food and packaging waste in the supply chain, which was launched this spring. A Defra spokeswoman said: "We are determined to support food retailers, industry and consumers in their efforts to reduce food waste but we do not believe in mandatory targets. The voluntary agreement with the retail grocery and manufacturing sectors sets ambitious targets for businesses but gives them the flexibility on how to meet them in the most cost-effective way." Alice Ellison, environmental policy adviser at the British Retail Consortium, said retailers took such commitments seriously and had reduced waste in the supply chain by 8.8% since 2009. "While cutting waste in the supply chain is important, these figures make clear that reducing household food waste will deliver the greatest gains for the environment, and this is another area in which food retailers have made significant progress." She said food retailers and manufacturers had recently committed to cutting household food waste by 20% from 2005-15. Large volumes of food past its "best by" and "use by" dates which might have once been sent straight to landfill was now sent by supermarkets to food banks run by charities such as FareShare and the Trussell Trust. Hannah Stoddard, head of economic justice policy at Oxfam, said: "Wasting this amount of food when almost a billion people go hungry every day and record numbers in the UK are using food banks, is nothing short of a scandal. It is a damning indictment of a food system that places greater importance on corporate profits than ensuring everyone has enough to eat. "It's great news that the biggest supermarket in Britain is taking tentative steps to tackle the problem, but we need urgent action like greater regulation and investment from governments worldwide to fix the system." Of the other major supermarkets, Marks & Spencer pointed to the progress it had made under its "Plan A" ethical and environmental programme, launched in 2007, with the aim of sending no waste to landfill by 2012. It said that for the 2012-13 financial year, the total amount of food waste it produced was down by 32% against 2008-09. "This reduction is partly because we now sell short-life food products at a discount to our customers. In this year, we sold an estimated 60% of the food products that would have otherwise gone to waste at a reduced price. "Most of our food waste (89%) is sent to anaerobic digestion and the remainder reused in other ways (including working with FareShare) – nothing goes to landfill."